Photo: The poet, Ahmad Javad Akhundzade, and his wife, Shukruya. In reading through the files of Azerbaijan's former KGB, Azad Sharifov found documents that speak for themselves, speaking volumes about the injustice and persecution that Azerbaijanis suffered under the Soviet regime. One story tells of poet Ahmad Javad, who was arrested and sentenced to death for his alleged crimes against the Azerbaijani people. His only "crime" was that his ideas of independence and nationalism did not correspond with the agenda of the Communist party. Javad was one of the many Azerbaijani artists and writers who was imprisoned and killed for having ideas that were considered to be dangerous to the Soviet system. Yellowed official documents vividly recount the tragedy of his case. Javad is most remembered for writing the words for the Azerbaijan National Anthem which were used during the Democratic Republic of Azerbaijan (DRA) between 1918-1920 and which have been reinstated now that Azerbaijan has regained its freedom (since 1991). From the archives of the former Azerbaijan People's Commissariat of Internal Affairs (KGB) come many cases that are absolutely impossible to read without feeling pain in one's heart. However, Case N12493 from the special archives shocked us completely. It's impossible for me not to write about the extent of human misery found here, hidden for more than half a century. Case N12493 is the file of Ahmad Javad Akhundzade, an outstanding Azerbaijani poet, writer, public figure, author of numerous essays and translator of the world's classic writers - Shakespeare, Tolstoy and Gorky - to name a few. In his case file we see a photo of Ahmad Javad, Prisoner No.1112. His face is determined, with undefeated eyes - eyes that seem to reveal a drama of its own. In reality, however, Ahmad Javad's lived a life of unfinished scenes. Arrested as "Enemy of the People"
The document continues, "He was one of the leaders of the Musavat Literature Union called Yashil Galamlar" (Green Pens-green is a color symbolic of Islam). According to the document, he refused to abandon his Musavat activities and continued work that was considered to be illegal. The document charged that he was trying to infuse the Musavat spirit of nationalism and independence into young Azerbaijani poets. The last page has a stamped signature and the words, "Secret." It is signed by a lieutenant of the State Security Office, from the First Special Department of the People's Commissariat of Internal Affairs of the Soviet Union. The last sentence reads: "The death sentence of Ahmad Javad Akhundzade was executed on October 13, 1937, in Baku." In less than six months of his imprisonment, Ahmad Javad was executed. Hence, Soviet authorities enforced rigid censorship on every publication. They believed that art and literature should be made "clear to the people," that it should serve the "Proletariat Revolution," as well as the "ideas of Lenin-Stalin." Basically, any published book, magazine or any other literary work had to ensure that its contents were "ideologically staunch," in effect, sterilized. Along with Ahmad Javad, many other talented literary critics, writers and poets, such as Husein Javid, Yusif Vazir (Chamanzaminli), Khuluflu, Ali Sabri Gasimov, Khanafi Zeynalli, Haji Baba Nazarli, Bakir Chobanzade, Kazim Alakbarli, and many, many other intelligentsia were repressed in their fight against spreading "strange" views and "politically harmful" works. The documents explicitly show the number of organized, "celebrated" political processes, methodologies constructed for the purpose of obliterating the Republic's intelligentsia during the mass repression of the 1930s and 1940s. There were numerous trumped-up charges made under the consent of Mir Jafar Bagirov, the head of the Communist Party in Azerbaijan, a cruel enemy of Azerbaijan's intellectual elite. By 1937, he had crushed most of these "enemies" on his path to power. The documents charged that in addition to being a member of the Musavat Party, Ahmad Javad was friends with Mammadamin Rasulzade, the founder of the Azerbaijan Democratic Republic, as well as with the poets Mishvig and Husein Javid. The documents said that "competent bodies" would not forgive Javad for saying that the day that Azerbaijan became under the Soviet regime was the most saddest, most grievous day of his life. They also would not excuse him for saying that he couldn't write anything in the Soviet "spirit," since he feared his friends might read such work and feel betrayed. Government methods such as shadowing, provoking denunciations, savagely pursuing those who thought differently, and repressing basic civil freedoms - all were tools they used to quiet Azerbaijan's intelligentsia. Such methods were insidious, and their effects penetrated so deeply into people to such a degree that husbands and wives were even pitted against each other. Others, envious of Javad's talent, denounced him in the press and in public meetings. But even when some people turned against him, Javad never slandered anyone. He held his position and defended his devotion to his nation. He answered his opponents, but never considered them his enemies. He was a humanist, and as such, he called for mercy and respect toward all men. In leafing through the yellowed pages of his case, one becomes convinced that the accusations against Javad were never verified-neither legally, politically or ideologically. Based on the illegally obtained testimonies of Rukhulla Akhundov, Professor Chobanzade and others arrested earlier, Javad was arrested in early July 1937, and immediately placed in the "inner jail" of the KGB prison, where conditions were so brutal that prisoners were given only bread, salt and water. They weren't allowed counsel, could not participate in their own trials, were forbidden any human contact, including their families. During the first few months that Javad was in custody, he strongly denied participating in any counter-revolutionary organization. But after some "illegal compulsion methods" applied in Bagirov's torture chamber, Ahmad broke down and pled guilty as charged. He testified that he led the sabotage on the "literature front." On September 9, 1937, after somewhat recovering from his beatings, Javad once again declared his innocence regarding any participation in counter-revolutionary organizations. Soviet officials beat, tortured and taunted prisoners to secure "confessions." Mariya Sergeyevna, the family housekeeper, was imprisoned at the same time as Javad. She later told his wife, Shukruya Khanum (who was later imprisoned for being the wife of the "Enemy of the Nation") that she had seen Javad on his way to the prison infirmary "with a bandaged head, deaf and feverish." In investigations made after Stalin's death, testimonies given by ex-KGB officials confirmed that Bagirov's agents tortured many, many prisoners. Ex-officials Mamedov, Likhachev, Krotkov, Khentov, Dudiyev and others were questioned and subsequently was charged and convicted for the cruel beatings and forced confessions of prisoners Rukhulla Akhundov, Mikayil Huseinov, Professor Chobanzade, Khanafi Zeynalli and others. Ahmad's arrest, imprisonment and so-called criminal "confession" were blatant violations of the most basic codes of criminal and procedural law. There were many violations in Javad's case. But we must underscore one in particular. As a rule, an investigation involving sabotage requires examination by proper authorities, or at the very least, proper documentation. This wasn't done in his case, nor was he informed about the charges against him. The investigation ended September 25, 1937, but the tragedy of Javad continued. Let's hope that such evil never occurs again, at the hands of brutal corruption of official investigations. On October 12, 1937, Ahmad Javad stood before the military board of USSR's Supreme Court under the chairmanship of Azerbaijan's "curator," Judge Matulevich. The evidence in this trial was staged from beginning to end. It is staggering to see that the document itself was printed beneath a sheet of carbon paper with the last name "Akhundzade" added at a later date. Not only were the materials of the preliminary investigation not authenticated, but without carrying out any investigation whatsoever, the investigating board charged Javad, convicted him without a trial and condemned him to death. He was executed October 13, 1937. Other members of the intelligentsia - Zeynalli, Talybli, Eminbeyli, Gubaidulin and Karimov - were shot on the same day. Even after Ahmad Javad's execution, Bagirov continued to hound and threaten his family. According to an official document, Bagirov ordered his agents to "arrest Shukruya Akhundzade as the wife of the betrayer of the Motherland, to lock her up and to take her into custody in the mixed jail of the city of Baku, to punish his young children in the reception center of Azerbaijan People's Commissariat of Internal Affairs, to search for arms, valuables and literature in Ahmad's apartment and to confiscate anything else and to turn them over to the government as part of its annual revenue." This document was signed by the head of the Eighth Department of the State Security Office, Lieutenant G. B. Kogan. Subsequently, Javad's wife was arrested and taken into custody. On October 27, 1937, Shukruya Khanum (Mrs. Shukruya) was questioned in the infamous "inner jail" for the first and last time. As with her husband and countless others, the investigator fabricated charges and mandated her confinement. On November 14, 1937, with the "blessings" of Soviet Republic Major Borshev, Case No. 6736 was forwarded to Moscow for examination by a select commission. And on December 9, 1937, this special commission made the decision to imprison Shukruya Akhundzade in a Siberian reformatory camp for eight years. She was to be among those in the "first leaving phase," which meant that she was considered a dangerous enemy of the Motherland, and had to be deported more quickly than other prisoners. "I beg you, People's Committee of State Security, for the examination of my application concerning my release. . . I consider myself not guilty. . . 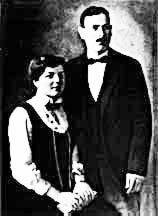 I was arrested because my husband, the Azerbaijani writer, Ahmad Javad Akhundzade, was arrested on July 4, 1937. Personally, I have never been charged with anything. I still don't know why my husband was arrested. I knew my husband to be an honest citizen. I think that his personal enemies were jealous of his fame and slandered him. "I am the daughter of Suleyman Bejanidze, who was an old underground-revolution organization member and was of Ajar nationality (a nationality in Georgia.) He was a privileged pensioner who was in jails and was exiled for 14 years. . . I have four sons. Two of them are fighting for their Motherland on the front lines of the Great Patriotic War (WW II). Both were wounded, but after recovering, they both returned to the front. One is fighting on the Leningrad front [St. Petersburg]. Because of his honorable services in battle, he was awarded the medal of the Red Banner. My younger son, Lieutenant Aydin Akhundzade, is fighting on the Khartov front and was awarded the medal of the Red Star for his services in battle. My third son, Tugay Akhundzade, 20, is working at Shamkhor. Yilmaz Akhundzade, my fourth son, 9, has been living with my third son since the death of his grandmother. "When I came to this camp, I was healthy, but now I am handicapped. I have lost much of my ability to work. . . I ask you to examine my application once again. . . I am sure that justice will triumph." How much power and spiritual beauty this woman had! Emaciated and physically exhausted from camp life, she continued to believe that justice would triumph. Yet no one considered her application. Shukruya also wrote to Stalin: "Please return me to my children. . . I will work to bring them up; they need to have an education. . . Pity my children, return them home to me, return their mother to them. . . My last hope in life is to get an answer from you." There was no answer. It's impossible to read her letters without a lump in one's throat. Of course, this pity isn't just for Shukruya, but for the bitter fates of tens of thousands doomed to suffer under Stalin's brutality. In July of 1945, the Azerbaijan People's Commissariat of Internal Affairs was given the official order to liberate Shukruya khanum "before the appointed time," after receiving positive character references for Shukruya khanum and her sons, who voluntarily served on the Soviet front lines. Still, she was not allowed to return to Baku; instead, she was forced to move to the Shamkir region. In December of 1955, the Office of Public Prosecution of the Soviet Union reconsidered Ahmad Javad's case. The military committee of the Soviet Supreme Court abrogated the illegal decision made by the special committee of the People's Commissariat. The Supreme Court ordered the case closed. Shukruya khanum was officially reinstated that same day. It took 18 years to rehabilitate the name of Ahmad Javad who was condemned as an "Enemy of the Nation" and shot to death despite his innocence. By that time, World War II had come and gone, and his two sons volunteered to fight in the front lines. By that time Stalin, too, had died. The truth is that only when Azerbaijan gained its independence in 1991 that Javad's name is gradually being restored. The words of the National State Anthem which Javad wrote when Azerbaijan won its independence the first time (Democratic Republic of Azerbaijan, 1918-1920) were re-adopted in 1991 after the collapse of the Soviet Union. After many long years, many of his great poems are again beginning to be published. But I have different wishes, desires! About these ruins that I see?! Towards those who are poor!